In recent years a lot of research has been done on the medicinal use of Cannabis sativa. Cannabinol (CBN), cannabidiol (CBD) and Δ9-tetrahydrocannabinol (Δ9-THC) are the most studied active ingredients for medicinal use treating several health disorders such as migraine, epilepsy and appetite loss. In addition to its medicinal use cannabis has been legalized by several countries as marihuana. 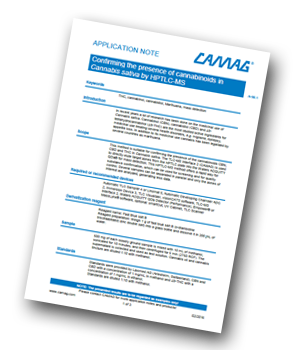 This method is suitable for confirming the presence of the cannabinoids CBN, CBD and THC in Cannabis sativa. The TLC-MS Interface 2 (CAMAG) is used to directly elute target zones from the HPTLC plate into the Waters ACQUITY QDa® for mass detection. This HPTLC-MS method offers a rapid way for substance confirmation, which can be used for screening and for quality control. Several samples can be separated in parallel and only the zones of interest are analysed, generating less data.